Welcome to A10 Talk’s Top 25 Player Countdown. Each day, we publish a new article counting down the 25 best players in the Atlantic 10 this past season. Today, we continue our countdown with #6 Peyton Aldridge. As Dayton’s floor general and member of the 2016-17 All A-10 First Team, Scoochie Smith comes in at No. 5 in our top 25 player countdown. A three year starter for the Flyers, Smith scored over 1,000 career points in his college career. Leading Dayton to four straight NCAA tournament appearances, including five tournament wins, Smith will undoubtedly go down as one of the all-time great Flyer point guards. Thanks to Smith’s efforts this season, Dayton was able to repeat as regular season conference champions and have another highly successful year. Scoring in double digits a remarkable 27 times this season, Smith put together plenty of outstanding performances to choose from. 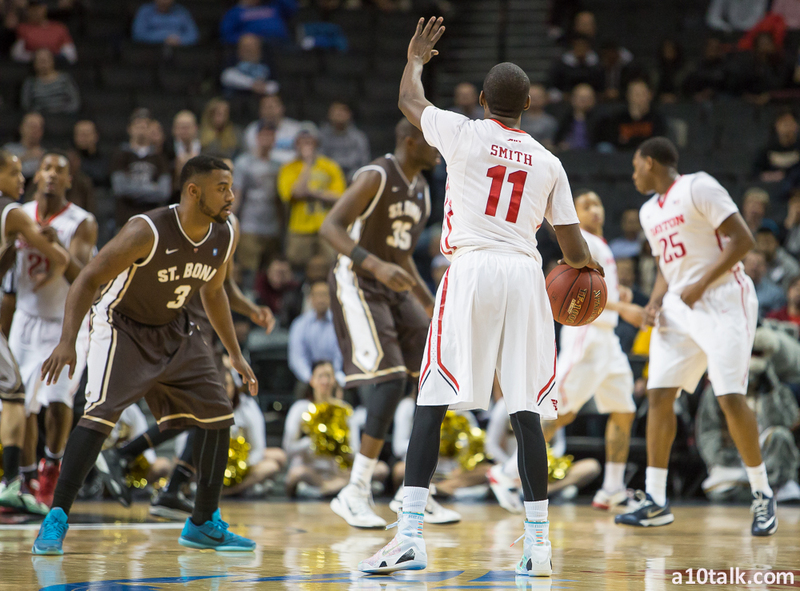 Two of Smith’s best performances, though, came in Dayton’s final four games of the year. With a regular season A-10 title on the line, Smith led the Flyers to a huge senior night win over VCU. Smith dropped 20 points, dished out six assists, and pulled down four rebounds as Dayton downed the Rams 79-72. The senior point guard’s craftiness left VCU coach Will Wade repeatedly asking his players in the huddle “Who can guard Scoochie?” Evidently no one could guard Scoochie, as the Flyers went on to secure their second straight regular season conference title. Averaging 13.8 points, 4.5 rebounds, and 3.1 rebounds per game, Scoochie Smith was arguably the A-10’s most complete guard in the 2016-17 season. Smith’s ability to dictate tempo and perform well in all aspects of the game made him the perfect floor general for Archie Miller’s team. Not only did Smith put up good statistical numbers, he did so at a very efficient rate. Shooting 39% from behind the arc and 77% from the free throw line, Smith proved himself to be Dayton’s most clutch player throughout the season. In addition to that, Smith provided plenty of value on the defensive end with an average of 1.6 steals per game. In his four years at Dayton, Scoochie Smith always put the team before himself. Rather than trying to boost his own stats, Smith had one focus: winning. As a member of the Flyer’s all-time winningest class in program history, Smith certainly left a legacy to remember at Dayton. If Smith does not hear his name called in the NBA Draft, he will most likely go overseas to play professionally. Whichever team does end up with Smith, they are guaranteed to get an outstanding floor general.